Save More with a smashing new Paytm Wallet Cashback Offer. Get 4% cashback on adding Rs.400 or more to your Paytm Wallet. 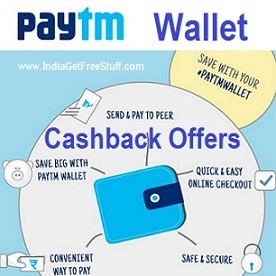 =>Happy Weekend Offer: Use Paytm Promo Code Wallet120 and get 4% cashback on adding Rs.400 to your Wallet. Users can add upto Rs.1500 and apply the code for Rs.60 cashback! Use promocode twice to get upto Rs.120 Paytm Cash! 1. Visit here to Add money to your Wallet. 2. Log in or Sign yourself. 3. Enter the amount to be added (Rs.400 or more). Use Paytm Promo code WALLET120. 4. User can use promo code twice. 6. Applicable on app and web. 7. Valid for new and existing users.